Let this be my first post on our (brainchild of Folie a Deux author, Jen) attempt to start Sweet Sunday Treats - sharing our own discoveries and sweet creations to all of you. I just emptied a box of this healthy beverage and thought I'd put this in. Though this is not really considered a 'sweet treat', I am recommending this satisfyingly smooth, subtly-sweet and healthy soy milk to everybody. A good milk substitute as well to cooking or baking needs. 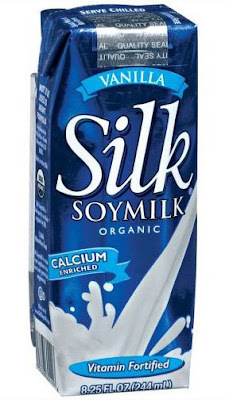 Silk Soy Milk is made with (as listed on the Vanilla box) organic whole soy beans, filtered water, organic evaporated cane juice, natural vanilla flavor, sea salt, carrageenan and vitamins & minerals. Other variants include Plain, Very Vanilla, Chocolate, and Unsweetened, and priced a bit higher (but worth it) than other imported brands currently in the local market today. This brand was first introduced to me by a mom from my boy's pre-school when I was in search of a non-dairy/casein-free milk for my son, whom we suspect to be 'allergic' to gluten and casein. Soy milk was her recommendation and Silk was her brand of choice for her own kids. I'm adventurous with food and drinks and I've tried several brands of soy milk in the past. But after my initial introduction to Silk, I was a fan. Silk is the best in terms of taste, manufacturing process and health benefits. It claims to be FREE of: lactose, dairy, eggs, casein, peanuts, gluten and MSG -- so no worries for the allergy-conscious population, moreover, it's vegan and certified kosher. Delicious and healthy. What more can you ask for? Do try their yummy Vanilla and Chocolate flavors, our favorites. It's the best-tasting of all brands I've tried, and Soyfresh (we like Malt, Strawberry and Chocolate) comes in second. To harp on the 'sweet' aspect for this post, their chocolate flavor is my bet with just the right sweetness. And considering it's non-dairy (ergo less creamy), the rich cocoa flavor wouldn't make you think you're drinking soy milk. My kids now happily prefer and have grown accustomed to soy milk, though I still believe this is an acquired taste. This is just my personal experience with the product and hope that once you try it, you will like it too. I am sure some of you have certain aversions to this, or even barf by just the idea of drinking it, hehe. Cheers and let's drink to (sweet) health! I will make sure to post something this Sunday for the Sweet Sunday Treats!!!! I missed this Sunday because...as you saw on my post, Saturday was a loooooonnnngggg day for us! P.S. Don't you just love Maia Larkin's work and her blog, Une Envie de Sel? will look forward to your sunday post ;) yeah, i'm already following her blog, really nice site, talented artist as well! Hi! What a coincidence! I just came home from the grocery two weeks ago with Silk choco flavored soy drink. It is yummy! If you want it fresh, though, there's a store along banaue st that sells anything and everything soy. My sis-in-law buys soy milk and tofu from that store. Lucky me, she sends some over for me.